Los Angeles-based Reef Worlds, whose team includes film and television designers, dive-site developers, and marine biologists, are designing next generation sustainable reefs for tourism and the environment in a race to save nearshore ocean habitat around the globe. While at the same time creating new revenue channel for their resort hotel clients. Environmental change has caused the loss of more than half the world’s reef building corals. Coral cover, a measure of the percentage of the seafloor covered by living coral, is now just 10-20 percent worldwide. The Caribbean, thought to be one of the more pristine global reef systems, has lost 80% of its coral cover in only the last 50 years. For resort hotels coral and reef loss translates into customer dissatisfaction. CEO Patric Douglas notes that while scuba diving and snorkeling are a $3-billion-a-year business, most resort developments don’t offer much in the way of special underwater experiences. “Many five-star resorts have one-star waterfronts,” says Douglas. Reef Worlds estimates there are 500,000 square miles of resort oceanfront with limited appeal to adventurous tourists due to rampant habitat loss. Worse yet, these zones have suffered decades of neglect as resort developers focused on land based amenities such as water parks and golf courses. “Reef Worlds was established five years ago with the goal of working alongside resorts to create sustainable artificial reef systems that help reduce tourism pressures on natural reefs. Reef Worlds are fully monetized discrete mini-marine “protected areas” within the resort’s own footprint, allowing them to brand the signature underwater experiences of their guests while creating and fostering regional habitat,” says Douglas. Reef Worlds have been promoting the economic and ecological benefits of what he calls “habitat tourism,” which would give resort owners a way to monetize the waters off their beaches, while relieving some of the pressure from aquatic tourists on natural underwater reef systems that are endangered or dying. Artificial reefs have been around for decades. Most were created with everything from sunken battleships to old tires—and most, says Douglas, are boring. “Who wants to look at a concrete triangle?” he asks. Reef Worlds designs and creates “dynamic reefs” to attract sea life and tourism interest, making them places people actually want to explore, he says. Douglas says Reef Worlds will be able to bring in projects at 10-20% of the cost of a typical resort water park, which can run $10 million to build and up to $2 million a year to market and maintain. And unlike land based entertainment facilities Reef Worlds sites slowly transform over time into habitat for a wide range of wildlife and corals like a typical artificial reef. Reef Worlds’ five acre “Pearl of Dubai” project will be located in the waters around the World Islands development. 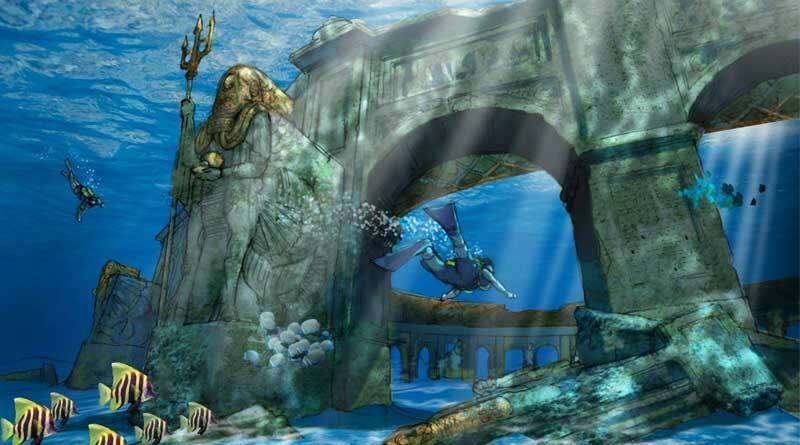 Renderings suggest the park might be modeled after the mythic Lost City of Atlantis. Reef Worlds has five projects in varying stages of development in Dubai, Qatar, the Philippines, and Mexico.